The second in the Ceroc Series produced by Nicky Haslam, Intermediate Level 1 takes you from Beginners through to Intermediate level and teaches you all the tips and techniques necessary to increase your confidence and skill level at intermediate level. Again partnered by Australasian Champion Louie Raish, Nicky & Louie demonstrate 18 of the most popular Intermediate Ceroc moves with professional voiceover instruction and slow-motion frames to help you learn the style and art of some great looking moves. Learn at your own pace and enjoy the Australian style of dancing and teaching. BONUS advanced freestyle footage of some of the top Australasian Ceroc dancers. Order your copy to add to your Ceroc collection. This original and professional instructional video is designed, performed and presented by Nicky Haslam, Founder of Ceroc in Australia and four times Australasian Champion, partnered by Robert Winter, Australasion Open Ceroc Champion. Together Nicky & Robert are UK Jive Masters Champions. 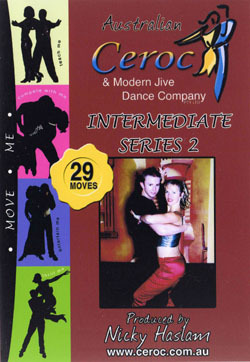 With easy to follow instructions, unique front & back views and slow-motion technique you can have fun learning 29 of the most popular Australian Ceroc Intermediate moves at your own pace. 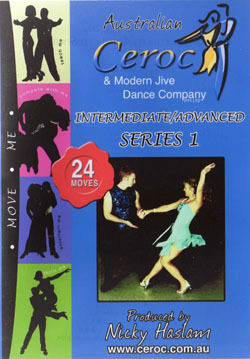 The Third in the Ceroc Series produced by Nicky Haslam, Intermediate/Advanced Level 1 takes you from Intermediate Level through to Advanced level and teaches you all the tips and techniques necessary to increase your confidence and skill level at I/A level. Again partnered by Australasian Champion Louie Raish, Nicky & Louie demonstrate 24 of the most popular Intermediate Ceroc MOVES AND DIPS with professional voiceover instruction and slow-motion frames to help you learn the style and art of some great looking moves. Learn at your own pace and enjoy the Australian style of dancing and teaching. This original and professional instructional video is designed, performed and presented by Nicky Haslam, Founder of Ceroc in Australia and four times Australasian Champion, partnered by Robert Winter, Australasion Open Ceroc Champion. Together Nicky & Robert are UK Jive Masters Champions. 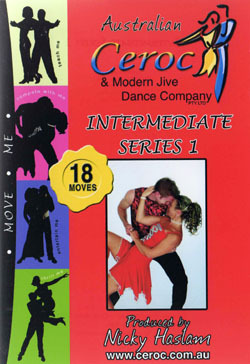 With easy to follow instructions, unique front & back views and slow-motion technique you can have fun learning 33 of the most popular Australian Ceroc Intermediate Advanced moves at your own pace. Killer Pretzel, Supertwister, First Move Knee Lift, First Move Windmill Dip, Manhattans, Tap, Step, Slide "Shine"